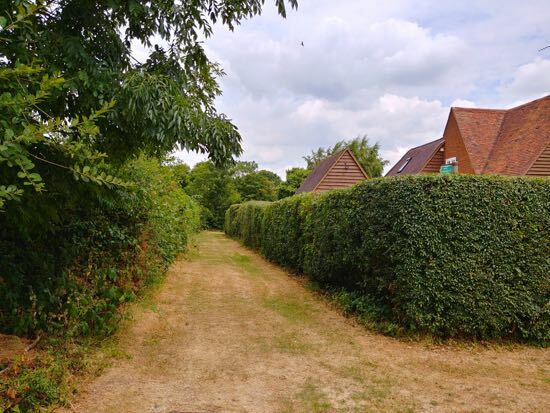 A gentle, slightly undulating walk through well-kept parkland, along quiet footpaths and lanes, and over fields offering open views across the Hertfordshire countryside. 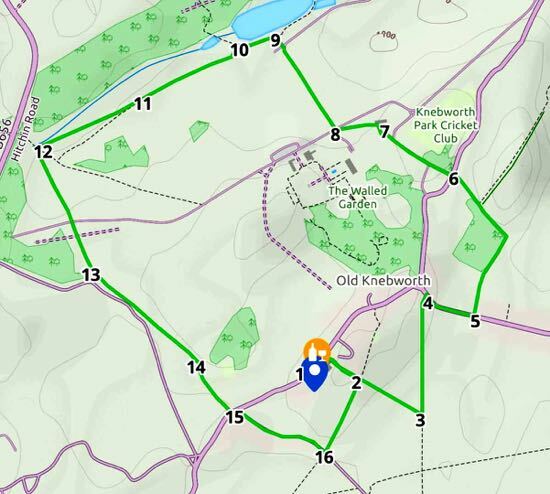 The route goes through the grounds of Knebworth House and starts and finishes at the Lytton Arms. 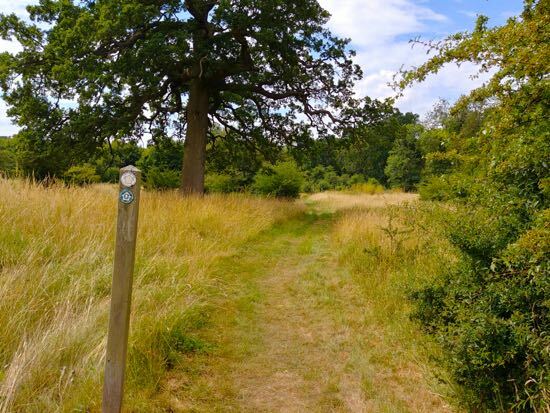 1: We have spoken to the management at the Lytton Arms and they are happy for walkers to use their car park if they intend to purchase refreshments before or after the walk. After parking the car return to the road and turn right heading past the pub looking out for a footpath sign on the right. Take this path as it heads south-east with the backs of houses on the left and an open field on the right. 2: You will soon reach a footpath crossroads just past the houses. Ignore the footpaths to your left and right and continue heading straight south-east along a path cut through the crops until you reach a footpath T-junction. 3: Turn left and head north until you reach Park Lane. 4: Turn right on Park Lane and walk east a short distance until you reach the point where the road narrows just before the houses on your left. Cross the road and take the footpath just before the first house. 5: Head north and north-east along this path passing a play area on your right. Go through a gate and continues north through the next field with the hedgerow on your left and the field on your right. Continue with Cowpasture Wood on your left and the open field on your right until you reach the corner of the field where you go through a wooden gate. Turn left, and, keeping the woodland on your left and field on your right head north-east. 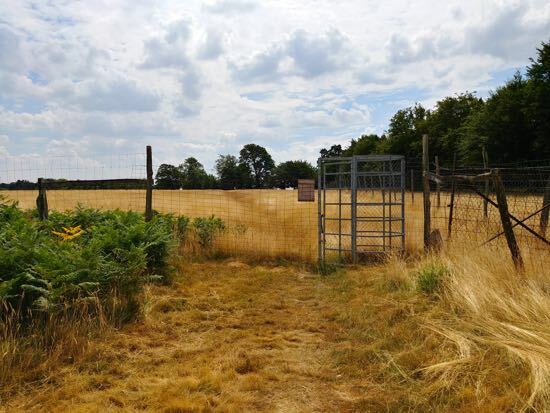 When you reach the corner of the field continue straight ignoring the path on your right until you reach Old Knebworth Lane. 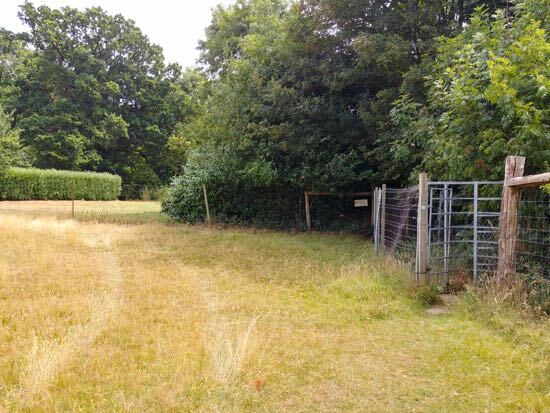 6: Across the lane, almost opposite and to your left, you will see a gate leading to the Knebworth House estate. Take this path and walk north-east through the estate heading in the direction of the church. At some point along this path you might meet a member of staff checking for tickets. 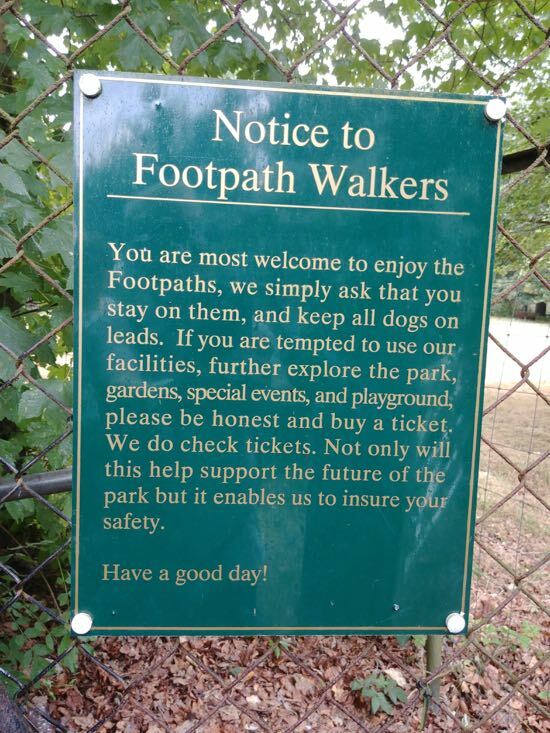 If you are a legitimate walker passing through you do not need one, but staff are employed to check that people are in fact passing through the estate rather than visiting it. 7: The path continues through the estate and enters the churchyard via a gate and emerges the other side to the left of the church, also via a gate. 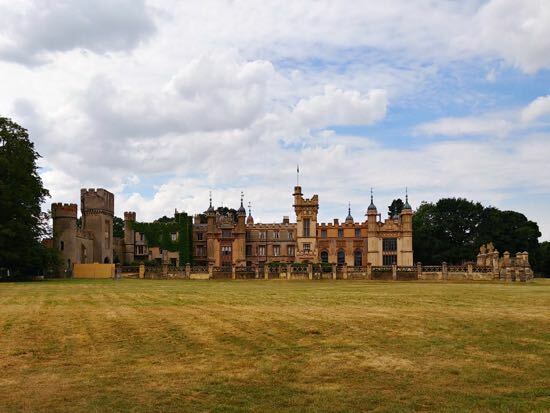 Continue heading east, with Knebworth House on your left, until you reach the estate road. 8: At the crossroads head north-east down an avenue of trees heading for the distant woodland. 9: On reaching the woodland turn left. Do not go through the gate into the woodland. 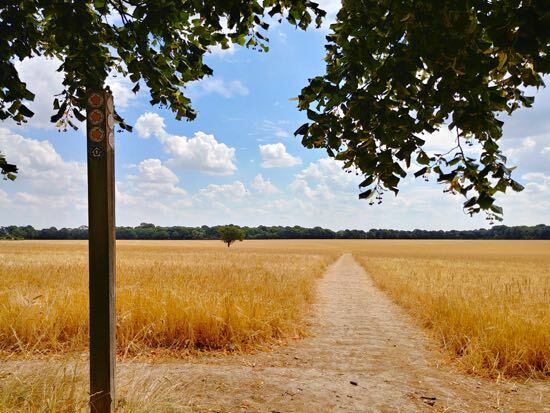 Follow the path as it heads south-west with the woodland on your right and the fields on your left. 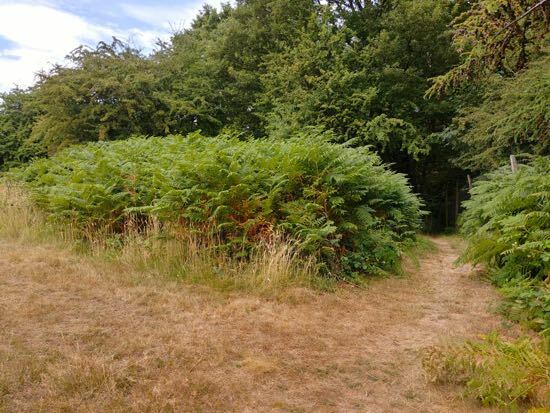 10: At the point where the path forks, take the left-hand fork and head south-west along a pleasant track that cuts through the bracken. 11: At a second fork, take the right hand fork and follow the way-marked signs. This area was popular with butterflies when we walked it in July. 12: At the footpath t-junction turn left, and follow the path as it heads south-east. You will pass through a couple of high gates, presumable tall to stop deer escaping. 13: Continue heading south-east and ignore a track to your left heading to the cenotaph; your way is slightly to the right of the monument, keeping the perimeter fence on your right until you reach another gate. 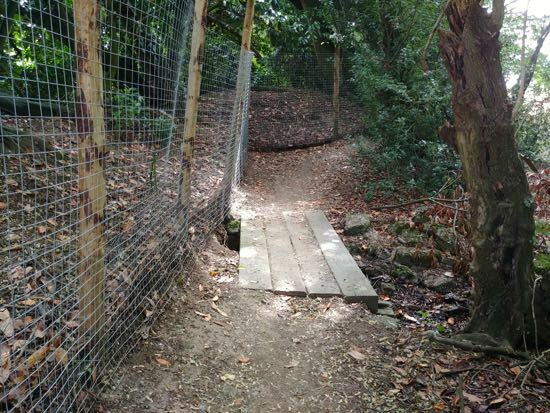 14: Go through the gate, cross a small wooden footbridge, through another gate, and continue with the hedgerow on your left and field on your right until you reach the Park Lane. You will go through two gates before reaching the lane and pass through someone's drive where the friendly home owner has put out bowls of water for passing dogs. 15: Turn left and then first right down Slip Lane for a short distance looking out for a footpath across the fields on your left. 16: Take this path as it heads north-west across the fields to meet the path on your left which you walked earlier and which leads back to the Lytton Arms. 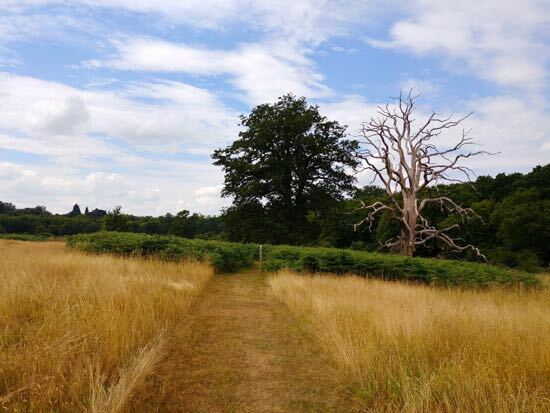 All photograph by Hertfordshire Walker released under Creative Commons BY-NC-SA 4.0. Those with smartphones and tablets can zoom in on the interactive map below.